Now, just forget those complex and lengthy database queries. MySQL database converter program is designed to get the desired database output thus by saving a lot of time and money. MySQL database conversion tool automates the database migration method without need of database experts. Database conversion software converts either whole database or selected database records from MySQL database to MS Access format, without altering originality in the actual composition of the database tables. MySQL database tool supports key constraints, data types, schemas, attributes, tables (rows and columns) during the conversion process. With the flexibility to work on all major versions of MySQL and MS Access databases, the software offers users with the facility to overwrite the existing database records with the converted database records or save the converted database records at any user specified safe location for further use whenever required. Database migration program is designed with suitability to assist organizations to convert large volumes of database records. The actual composition of the database records consisting of all database key constraints like null value constraints and primary key constraints, fields, data types, tables (rows and columns), schemas, indexes, attributes etc remain stable even after the database conversion. Simple working interface of the database migration application enables any category of user to easily understand the software functionalities and operate it. No expert guidance or prior technical knowledge is required before working upon the product. Software migrates bulk MySQL databases into MS Access. User can also convert the entire database or selected records for conversion. 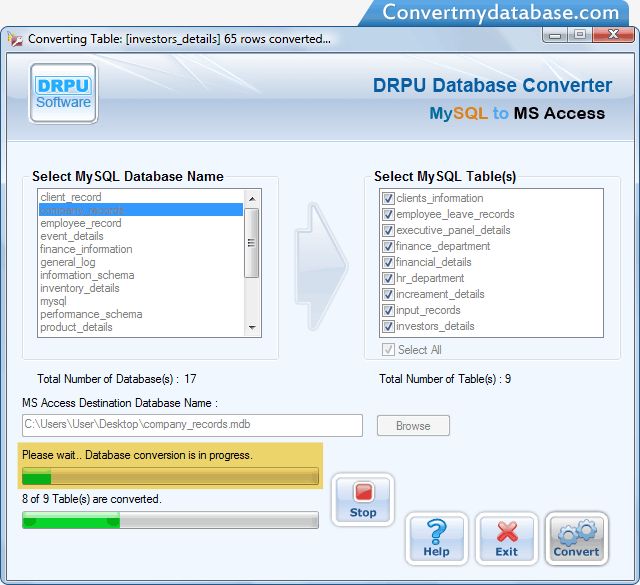 Convert single or multiple database records from MySQL to MS Access database format. Supports all major versions of MySQL and MS Access databases. No need for software user to be trained in database query language to understand and run the program.